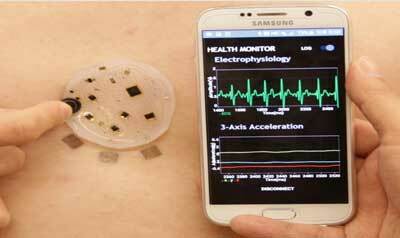 (Nanowerk News) A new, electronic skin microsystem tracks heart rate, respiration, muscle movement and other health data, and wirelessly transmits it to a smartphone. The electronic skin offers several improvements over existing trackers, including greater flexibility, smaller size, and the ability to stick the self-adhesive patch -- which is a very soft silicone about four centimeters (1.5 inches) in diameter -- just about anywhere on the body. The microsystem was developed by an international team led by Kyung-In Jang, a professor of robotics engineering at South Korea's Daegu Gyeongbuk Institute of Science and Technology, and John A. Rogers, the director of Northwestern University's Center for Bio-Integrated Electronics. The team described the new device in the journal Nature Communications ("Self-assembled three dimensional network designs for soft electronics"). The electronic skin could be used in a variety of applications, including continuous health monitoring and disease treatment. Professor Jang states "Combining big data and artificial intelligence technologies, the wireless biosensors can be developed into an entire medical system which allows portable access to collection, storage, and analysis of health signals and information." He added "We will continue further studies to develop electronic skins which can support interactive telemedicine and treatment systems for patients in blind areas for medical services such as rural houses in mountain village." The microsystem could also be used in other areas of emerging interest, such as soft robotics or autonomous navigation, which the team is now investigating.